Note: The Attendance assignment will not appear until you have taken roll for at least one student. 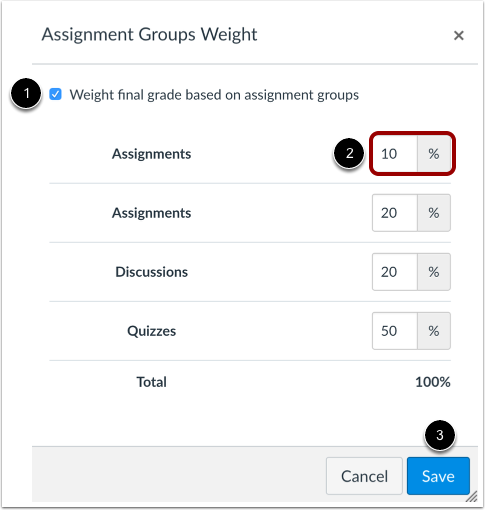 If you are using weighted assignment groups and would rather set grade weighting for attendance, you can create a new weighted assignment group for Attendance. 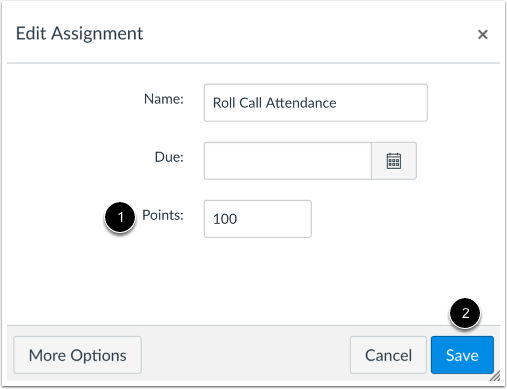 You can drag and drop the Roll Call Attendance assignment by clicking and grabbing the handle icon. Note: You can also move the assignment by editing the assignment, locating the Assignment Group menu, selecting the name of the assignment group, and saving the assignment. In Assignment Settings, click the weight final grade checkbox . Set the group percentage value to your preferred percentage value (zero up to 100) , then click the Save button . Make sure the Attendance assignment is moved into the Roll Call assignment group. The percentage value you set for the group will control the point value assigned to the Attendance assignment, despite the assigned point value. Note: If you want to set the percentage value as zero, the point value for the assignment must be higher than zero. Canvas cannot calculate weighted assignment groups with zero points possible. To change the point value for the assignment, edit the assignment, then in the points field , enter the new point value for attendance. At the bottom of the window, click the Save button . The Gradebook doesn't currently adjust point value changes accurately after point values have been changed, and the percentage values in the SpeedGrader and the Gradebook will be incorrect. 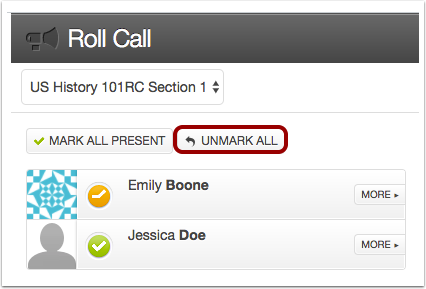 Return to roll call, click the Unmark All button, and then take attendance for all students as normal. The percentage value will then adjust correctly in both SpeedGrader and the Gradebook. If you make this change immediately after the first time you take roll in your course and edit the point value, you only have to adjust your work once. 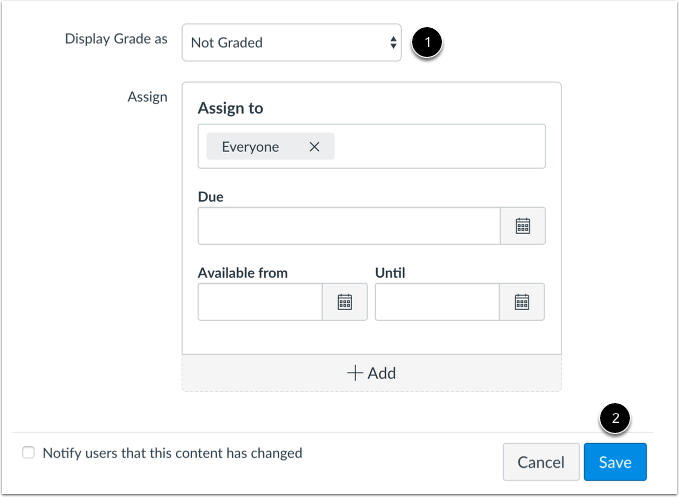 To remove the assignment from the Gradebook, edit the attendance assignment, then in the Display Grade as menu , select the Not Graded option. At the bottom of the window, click the Save button . Edit the attendance assignment, then select the Do not count this assignment towards the final grade checkbox . At the bottom of the window, click the Save button . Previous Topic:How do I create a roll call seating chart using the Attendance tool? Next Topic:How do I take roll call using the Attendance tool? Table of Contents > Attendance (Roll Call) > How do I edit the Roll Call Attendance assignment?